Is Cumbria's Dalston Hall haunted? Dalston Hall is a beautiful Grade II listed castle and is situated in acres of private woodland and gardens. The area around the Hall was once occupied by the Romans and then the Danes. Later the warrior Scots frequently invaded the area, leading to the construction of fortified structures known as Pele Towers. 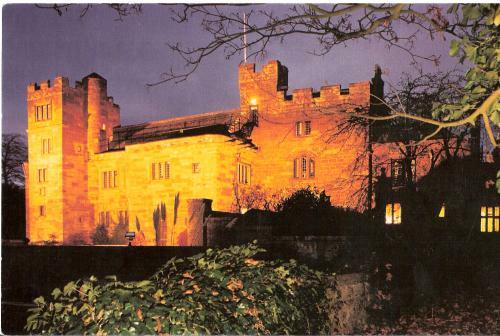 Built in 1500, the Halls and Pele Tower initially stood alone. Various additions and extensions were made in subsequent years. In 1897, extensive refurbishment of the interior took place, together with the construction of the entrance side of the building. Finally, in 1971 the hall was turned into the hotel you can see today. The Baronial Hall - which is the oldest part of the building - seems to be the most active place, with ghostly figures seen lurking by the iron gate door and an entity which appears as a black fog that rises from the floor - over the years this black fog has come to be known as Mr Fingernails. Why? I have no idea! In room 5 it's been reported that guests have awoken to find that the bed clothes have been removed, and they are neatly folded at the bottom of the bed. Unsurprisingly, many of these guests have left the room and refused to stay another night until they're moved into another room!